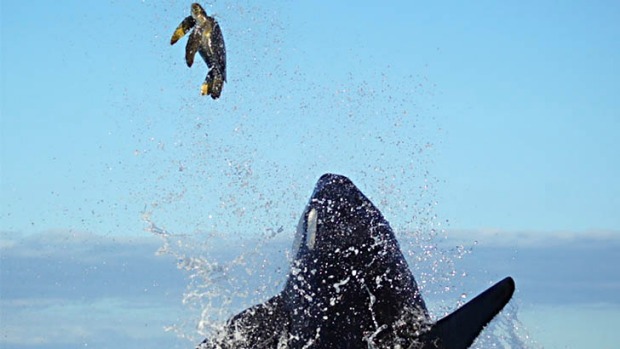 Incredible footage captured by Traveller.com.au editor Craig Platt shows an orca throwing a green sea turtle metres in the air as it plays with its prey off the Galapagos Islands. The reporter travelled as a guest of the South America Travel Centre. We weren't even supposed to be here. But our walk exploring the island of Fernandino has suddenly transformed into a chase at sea. We had been exploring the volcanic coast of this Galapagos island on a relaxing stroll, being careful not to step on the hundreds of marine iguanas lying in the sun and watching sea lions frolic in the shallows. But then our guide, Javier, interrupts his nature talk with an exclamation: "Look, killer whale!" We follow his gaze and see the huge, black dorsal fin of an orca cutting along the surface of the water close to the shore. We debate, as a group, whether Javier should call our cruise ship, catamaran the Ocean Spray, to send one of the ship's inflatable boats to pick us up and take us for a closer look. Personally, I'm in two minds about it. Whale-watching is a hit-and-miss affair – sometimes you get lucky and see a whale do something interesting, but other times you simply see their backs and watch them occasionally surface to breathe through their blowholes. 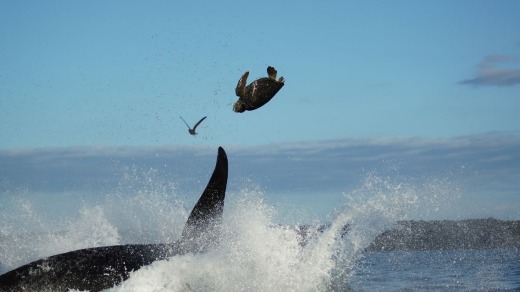 My previous experience with killer whales, off Vancouver Island in Canada, was the latter. Nevertheless, this whale is cruising the shoreline with some speed, close to the surface, so we opt to get picked up and go for a closer look. We're soon on the open water, following the whale as its large, black dorsal fin rises above the surface. After a few minutes the whale disappears, but just to the side of our boat a strange flattening of the water's surface occurs. We sense something is going on down there. Suddenly the water just off our bow erupts as the whale surfaces just a metre or two from the dinghy, a hapless turtle caught in its jaws. The turtle, with its hard shell, is no easy meal for the whale though, and we see it struggling, looking like it is almost riding the head of the whale like a wave. After passing the boat the whale violently thrashes its head from side to side seemingly trying to tear the turtle apart. Both creatures then disappear back beneath the water and all is still again. The theme from Jaws suddenly starts playing through my head. My own jaw agape during the surfacing, I realise that I didn't even bother to look at my camera as I fired off a dozen or so shots, most of which turn out to be badly framed or out of focus. "It doesn't matter, we saw it – that's the important thing," says fellow traveller Julie from the UK. And I agree. Little do we know the show was just beginning. A few minutes later, a turtle appears on the surface of the water, just a few metres away from the boat. It's alive and appears to be intact. "There's another turtle," I say, "... or is it the same one?" My question is answered a split second later when the whale explodes from the water directly beneath the turtle, knocking the poor creature 25 metres into the air with its snout. The whale's own body lifts almost completely out of the water too, before heavily splashing back down. The dazed turtle remains floating on the surface and the whale comes back two more times to repeat the incredible manoeuvre. It's both awesome and terrifying to see the speed and power of the huge animal so close to our – now seeming very small -– inflatable dinghy. Even our implacable guide Javier seems impressed. He hasn't seen a killer whale in the islands for 18 months and, while he's seen them catch prey before, he's never seen one exhibit this behaviour. Ari Friedlander, a whale specialist from Oregon State University's Marine Mammal Institute, says sea turtles are not a common prey for orcas. "The teeth are designed for grasping not shearing or crushing so my guess is that they try to extract the turtle from the underside rather than break through the shell," he said after viewing the footage. 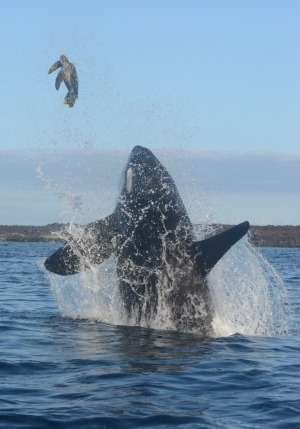 Friedlander says orcas will commonly toss or slap larger prey such as sea lions or dolphins to stun and immobilise them. This whale, which he guessed to be an immature male, may have been treating the sea turtle in the same way. On the other hand, it might have just been playing with its food. The water is now still and it's only at this point, my heart racing, that I can get my head around what I've just seen. I also begin to feel quite nervous. The realisation that the six-tonne animal could have miscalculated and hit – or landed on – our boat is somewhat terrifying. On the other hand, the accuracy with which it repeatedly struck the turtle probably means that was never a possibility. 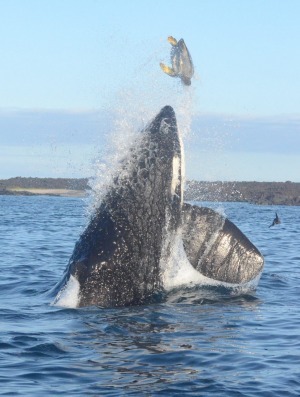 Now done with its display, the whale swims off, seemingly having devoured its catch. A group of frigate birds follow it, hoping to pick up some scraps. Meanwhile, we turn back to the Ocean Spray with a feeling of exhaustion and elation having seen one of nature's most incredible predators, close-up, in a spectacular scene. I've seen a lot of wildlife in my travels – lions, leopards, polar bears and penguins, but never anything quite like this. 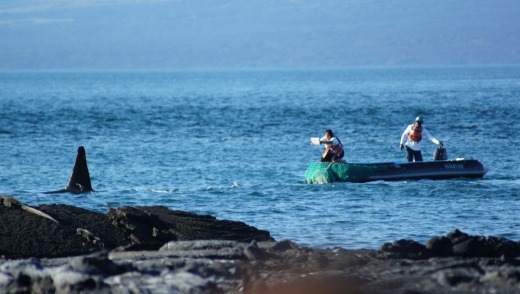 That is the joy of the Galapagos Islands though – its diverse and abundant wildlife will never cease to surprise you.